This week on the Dread Media podcast, episode 457, I take a look at the first of the only two films that Vincent Price, Peter Cushing and Christopher Lee starred in together. 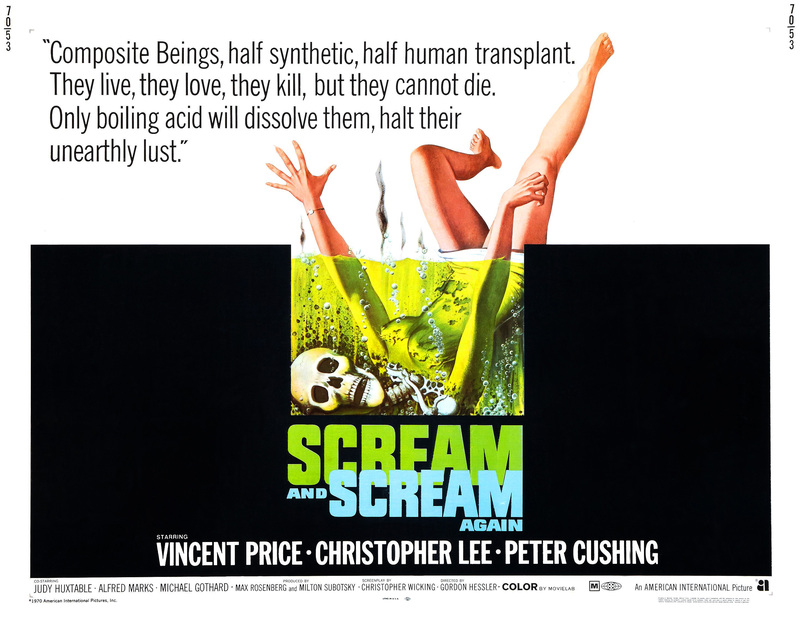 However, Scream and Scream Again (1970) is a bit of a cheat considering that Cushing never appears on screen with Cushing or Lee. Furthermore, Price and Lee only have one scene together. That said, it has its moments and is worth checking out. Watch the trailer and see if you notice anything odd, then do some shopping on Amazon for the DVD or Blu-ray versions. There’s one more Vincent Price film coming before the month of May is done…Convicts 4 (1962)! Who is that supposed to be Peter Cushing?? In the trailer, they have Cushing’s name appear over the face of actor Marshall Jones. Unforgettable goof on the editor’s part.